During a Energy and Natural Resources Committee Hearing, U.S. Senator Martin Heinrich (D-N.M.) questioned President Trump’s nominee for Secretary of the Interior David Bernhardt about plans for the area around Chaco Canyon and about proposed cuts in President Trump’s budget to the Land and Water Conservation Fund. Bernhardt has been serving as the acting Secretary of the Interior since the previous Interior Secretary, Ryan Zinke, resigned in December. March 28, 2019. U.S. 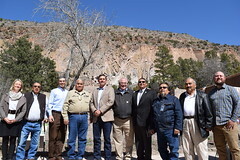 Senator Martin Heinrich (D-N.M.) announces plan to introduce legislation to establish Bandelier National Monument as a national park with support from tribal leaders, local elected officials, and community leaders. March 20, 2019. At 12:00 p.m., following any Leader remarks, the Senate will proceed to Executive Session and resume consideration of the nomination of Wilbur Ross, to be Secretary of Commerce.